Chocolate Coconut Butter Bites: Eat Your Coconut Butter on the Go! When I’m home, I normally turn to my cinnamon butter bites or homemade mint chocolates when I need an extra shot of fat. Since both butter and coconut oil melt at room temperature, however, neither of these options works well when I’m out and about. 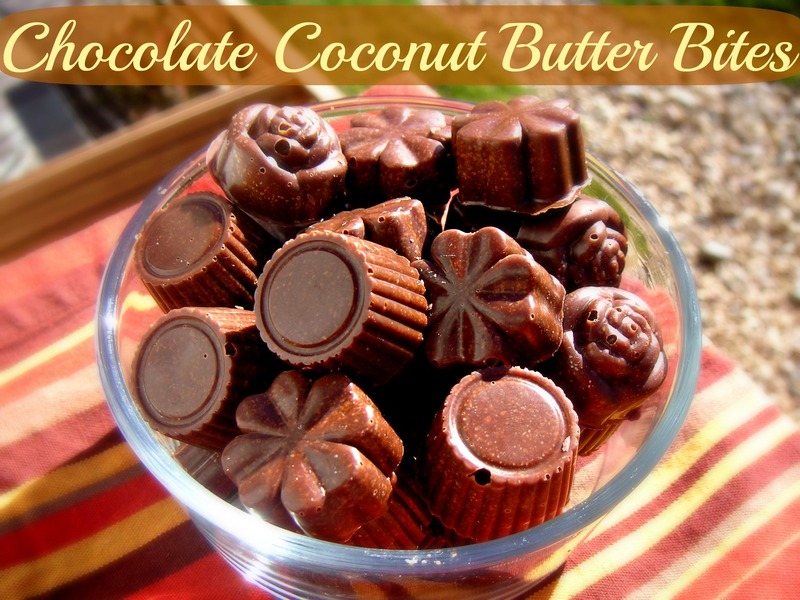 Recently I came upon the perfect solution: chocolate coconut butter prepared in chocolate molds! Jesse and I have been making chocolate coconut butter since last winter, so I already knew that it’s pretty temperature stable. Normally we just eat it out of a large container with a spoon, though, which isn’t all that travel-friendly. Freezing the coconut butter in chocolate molds instead of a single container, however, produces bite-sized coconut butter treats that are perfect for bringing on the road. To prolong the shelf-stable nature of these chocolate coconut butter bites, I recommend storing them in the freezer most of the time. This will lengthen how long they stay firm when at room temperature. After a few hours, they will definitely begin to soften at room temperature, but in my experience they tend to become mushy rather than becoming completely liquid. If you’re ever tried to travel with homemade chocolates made with coconut oil, you know that they can become completely liquid after a few hours at room temperature, but since these chocolate coconut butter bites are made from ground up dried coconut rather than just coconut oil, they keep their shape much better. Food processor: You might be able to make this recipe in a blender. I haven’t tried it myself so can’t be sure. I prefer my food processor for making coconut butter because the cleanup is much easier. I have this food processor, but any good food processor should work. Silicone chocolate molds: To make these portable, I highly recommend using silicone chocolate molds. You can find a ton of different options for these online. Here are the molds I used in the photo above. More recently I purchased this set of molds, which is more economical but just as high-quality, as far as I can tell. Dump shredded coconut into your food processor. Process until the shredded coconut becomes liquid. This usually takes about 10 to 15 minutes in my food processor. During this process, occasionally turn off the food processor to scrape down the sides of the bowl and reincorporate far flung pieces of coconut. Add the cocoa powder, honey, stevia and vanilla. Process until all ingredients are thoroughly mixed. Taste the coconut butter. If you are happy with the texture, spoon it into your molds. If you prefer a smoother texture, continue to process the butter until it reaches your desired consistency before spooning into molds. Put molds into the freezer for thirty minutes or so to allow coconut butter to harden. After it's completely solidified, pop out finished bites and store in a container in your freezer. Enjoy! If your food processor is on the smaller side, you may want to start out processing just half of the shredded coconut. Allow the food processor to run for about 5 minutes, at which point the coconut should have reduced in volume enough that you can add in the second half without overfilling your machine. I have brought these coconut butter bites through airport security several times without any issues. As long as they stay completely solid you should not have any problems. Just make sure to start out with them frozen (or at least thoroughly chilled) to minimize the chance that they will start melting before you make it through security. If you’re a fellow coconut lover, I suggest you also check out my recipes for lemon coconut delights, coconut berry delights, no-bake chocolate coconut cookies and flourless chocolate coconut butter cookies. 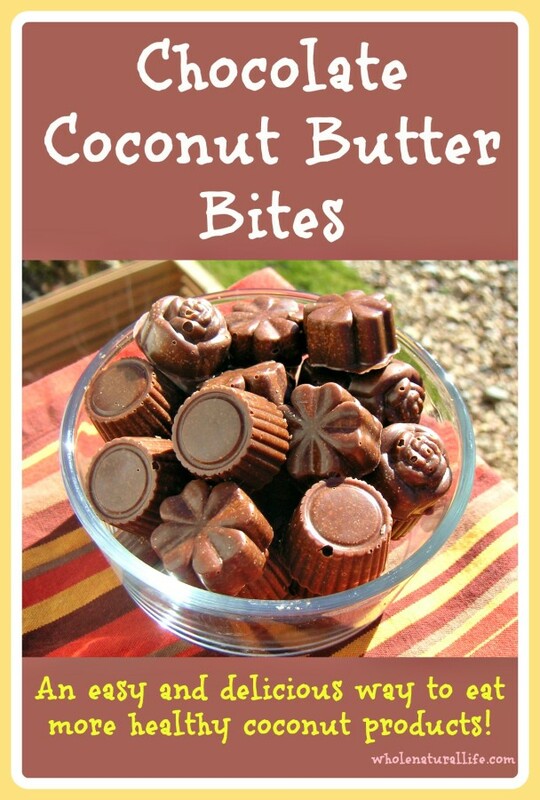 42 Responses to Chocolate Coconut Butter Bites: Eat Your Coconut Butter on the Go! would this be a great way to get your coconut oil? or actually, are they even the same thing? I want to get at least 3 tbls a day in but for some reason my body can't handle it and i get nausea's. Coconut butter is made from shredded, dried coconut, so it should still have all of the oil intact. (I suppose it's possible that they also sell some sort of "defatted" shredded coconut, although I have never seen it. Just make sure that they don't mention anything about this on the package.) So yes, it is a good way to get your coconut oil. You have to eat more volume-wise, though, since coconut butter contains all of the coconut meat rather than just the oil. How are you trying to eat the three tablespoons? Are you spacing it out over the day? Kelsey, I put a tbsp over my roast pork or beef or chicken. Takes on a rich meat flavor and adds juiciness to leaner cuts of meat. Yum! When I saw these on G+ the other day I knew I had to try them. So good! I was wondering if you can used coconut oil instead? I can't get shredded coconut in my grocery store. Thanks! Stephanie, you can use the same general idea with coconut oil, although I wouldn't use this exact recipe. I'd try my mint chocolate recipe. You can tinker with the extracts to give it the flavoring that you want. Oh, and I buy my shredded coconut from Amazon, if you wanted to try getting some online. Thanks for sharing at Modern Alternative Kitchen's Meal Plan Monday link-up! We hope to see you again this Monday! Wow! These look like a great healthy treat! Thanks for sharing them on Natural Living Monday. Do you have nutritional values for this? They are delicious. I used the dark cocoa and they are quite yummy. No, I don't have nutritional values on this. I think you could look up the values for the particular ingredients and calculate it yourself, if you are so inclined. I'm glad you liked them! LOVE chocolate and coconut! Pinned! Hi - how many Silikomart molds are needed for one recipe? I'm not sure how many molds it fills up, Sandie. But you really only need one, as long as you don't mind filling, freezing, and then refilling a few times. Personally I have three different molds as that what fits well in our freezer. I just tried for over 1/2 hour to make coconut butter with my shredded coconut and it did nothing. Any ideas? Betsy, the only thing I can think of is that perhaps your food processor is too big for that amount of shredded coconut. Did it seem that the coconut was just getting pushed up against the sides of the bowl rather than interacting with the blade? If you think this might be the problem, you could try doubling or tripling the recipe to fill up the bowl more. Good luck! Hi Betsy - I use a 700 watt, 12-cup KitchenAid food processor and it only took between 10-15 minutes for my coconut to liquify, making a single batch. Also, does it seem that the usual blenders tend to overheat because of using dry ingredients ? This happened to me with my big strong vitamix, and I'm 99% sure that it was because I used desiccated coconut (this type of coconut is especially dry, and it's harder to get the little fat in it out). So to fix this, I added some melted oil with a good amount of shredded coconut and just made some fantastic, deliciously creamily amazing coconut butter! Good luck :)!! The stuff that I buy is dehydrated, shredded, unsweetened coconut. I don't think that there should be a difference between dehdyrated and dried, though. A few other people have had the same problem with it not liquifying. This has never happened to me so I'm not sure what's going on. The only possiblities that I can think of are either that your food processor is not powerful enough or that the volume of your food processor bowl is too large for the amount of coconut that you're trying to grind. Like I said to an earlier user, add some melted coconut oil to your shredded coconut, and everything will work out great :)! Hi :)! I'd love to make this recipe, but I don't want to remake so much coconut butter as I already have coconut butter on me. Do you have any idea how much coconut butter I'd use (how many cups are your blended up coconut shreds once they're all creamy/done)? Hmm... I haven't made this recipe for a while. I think it's around 2 cups, but I'm not sure. You can always just add all the other ingredients to taste until it tastes good to you. Okay, thanks for the advice :)! I'll make sure to try this recipe out. My food processer is not making it. Can I just buy the coconut butter instead of trying to make it by blending shredded, unsweetened coconut? how much do I use? Probably not 5 1/3 cups- how much does it grind down to make? Thanks! The main reason to make it yourself is because buying coconut butter is incredibly expensive compared to making your own from shredded coconut. But it's fine to buy it if making it yourself isn't working. I've never actually measured the finished product, but I think it's around 2 cups? I'd just add ingredients to taste and stop when it tastes good to you. How much coconut butter do you have after processing? My real question I guess is how much coconut butter would you use, I have some already made into coconut butter. Can I use concentrated coconut cream (Tropical Traditions) instead of making the coconut butter myself? And if so, how much do I use? This looks awesome! And can I substitute more stevia for the honey? How many honey do you add if you don't use the stevia liquid? Hi Florence, I'm not sure. Just add more honey until it tastes sweet enough to you. I'd probably start with a tablespoon and work up from there. Hope that helps!